Download Your FREE Landscape Painting Techniques eBook Today! If you have been in search of free landscape painting lessons, we have you covered! Due to popular demand, we’re offering this FREE eBook on how to paint landscapes. Whether you prefer watercolor, oil, or another medium for your landscape paintings, these lessons will help define your skills and enhance your art. From the canvas to your completed masterpiece, these downloadable oil and watercolor art lessons are perfect for the aspiring landscape artist, whether beginner or experienced. Learn alongside two skilled landscape artists as they share their best-kept secrets and unique techniques to help you develop your own style of painting landscapes. See your landscape artwork come to life with the help of the free painting lessons in this eBook. We put together this free collection of tutorials with insight from two skilled landscape artists, giving you virtual step by step art lessons to learn from. Download your copy today to get expert tips plus three demonstrations of how to paint landscapes and learn how to combine watercolor and oil painting tips with landscape painting instruction to create landscape art masterpieces. Along with these FREE lessons, you’ll also receive a free membership to our Artists Network community. Your membership provides you access to our instructional blogs, art videos, galleries, and our daily email newsletter with all sorts of tips, techniques and more free tutorials! For Steve Armes, the goal of landscape painting is to paint stirring images that engage and inspire viewers, and this is more likely to happen when he uses information from a variety of sources. Armes conducted a painting demonstration during a recent workshop in Italy, where he showed his students how he creates an on-site sketch that serves as the basis for a larger studio piece. Watercolor landscape painting artist Joseph Bohler believes in being fully present during a painting session, which is one reason he likes landscape painting so much. He even occasionally uses a recorder to capture the sound of the water or nearby horses, and he will scribble in a journal to note the smells, temperature, or how he feels at that moment. He takes photos, but it is abundantly clear that he is truly in his element while painting outdoors. Being physically present while painting landscapes does infuse the painting with life, but landscape painting on-site has its challenges—not the least of which is all the information present outside of a reference photo. He recommends spending some time taking in the surroundings, before setting up. Landscape watercolor artist Joseph Bohler liked the building in this scene but thought the background was a bit busy. So, during this landscape watercolor painting workshop, he demonstrates how to capture the essence of the scene by eliminating half the trees and much of the detail in the background. Throughout this demonstration, he covers how to paint light, dark, and accents that lead the eye through the painting. 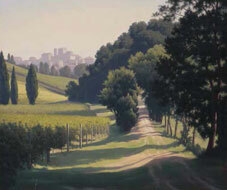 To begin this demonstration landscape artist Chris McHenry referred to the oil study and photographs from the subject he selected, to carefully draw the outlines of the landscape elements he wanted to include in the landscape oil painting. Since Chris is painting in his studio for this demonstration, he is able to develop many more details in the scene. After he covers the entire canvas with oil color, he went back into sections of the landscape to add refinements and subtle transitions of colors and values. 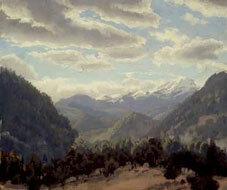 Have you been searching for free lessons on how to paint landscapes? Do you love to make your own landscape artwork? Claim your free copy of this fabulous eBook today! Whether you are a veteran at creating landscape paintings, or simply want some basics to learn how to paint landscapes, this free eBook’s collection of free art instruction is one you’ll turn to again and again. Discover why landscape artists around the world love to experience and share the art of painting landscapes. Get your art supplies ready and begin painting landscape artwork today. Download your free eBook to get started painting landscapes like the pros! With your copy of lessons for painting landscapes, you’ll get all of these expert landscape painting techniques plus three painting demonstrations, right at your fingertips. With proven techniques on how to paint landscapes all in one booklet, you’ll be able to get started right away. In fact, these two landscape artists provide such great insight into their tips and techniques, you won’t want to wait to translate them into your own landscape artwork masterpiece.